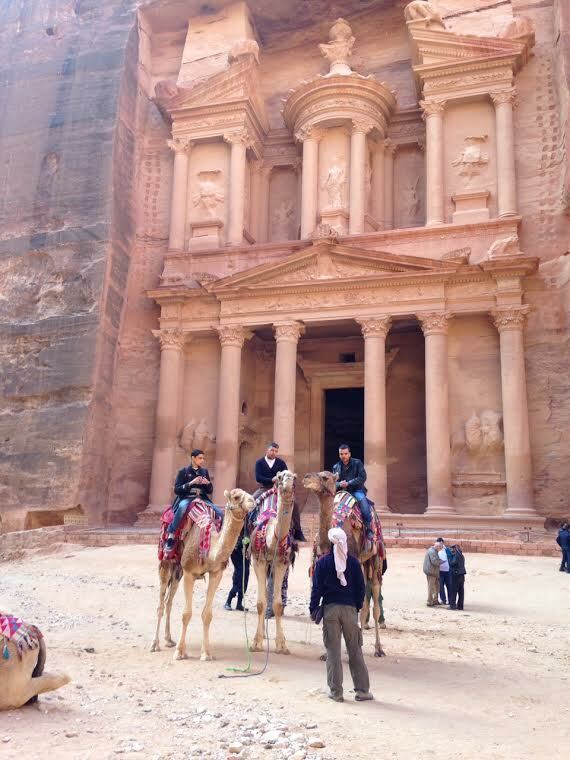 If you have any interest in history or the spectacular Petra (Jordan) must be on your wish list. It is one of the great sites of antiquity and very accessible. It remained unknown to the Western world until 1812, when it was located by Swiss explorer Johann Ludwig Burckhardt. It was described as "a rose-red city half as old as time" in a prize-winning poem by John William Burgon. Petra boasts over 800 individual monuments, including buildings, tombs, baths, funerary halls, temples, arched gateways, and colonnaded streets that were carved from the sandstone over 2,000 years ago. You approach the centre piece, called The Treasury, through a deep narrow gorge, known as Al-Siq, then burst out into the sunlight and an amazing edifice. Words cannot really describe this astonishing testimonial to people long gone. In 1818 the Hon Charles Irby and Mr James Mangles, commanders in the Royal Navy, described their first sight. "We do not know with what to compare this scene," adding: "perhaps there is nothing in the world that resembles it." The Treasury's original purpose remains elusive – except that it was not a Treasury. It is impressive, guarding the entrance to the city. The full site covers 65 acres, the descent from the visitors centre as long as 2½ miles depending when you decide to turn back. It is hard to get lost but easy to get tired. The admission fee includes a donkey ride on your return to the entry point up a steep slope but the handlers do expect a fairly decent tip. Also available are horse drawn buggies and some modified golf carts, but it is slow going with either, the roadway surface very irregular. Petra lies on the slope of Jebel al-Madhbah (identified by some as the biblical Mount Hor) in a basin among the mountains which form the eastern flank of Wadi Araba, the large valley running from the Dead Sea to the Gulf of Aqaba. It has been a UNESCO World Heritage Site since 1985. By mainly fine dual carriageway it is three hours (237km) south of Amman, and just over half the distance (130km) and something less than two hours from Aqaba. If you are on a cruise it is an easy day out including lunch at one of the many first class eateries in the quite large town of Wadi Musa which adjoins the site. Likewise from Eilat (Israel) the journey time is much the same but allow 30mins from your hotel to the (simple) border crossing, your Israeli taxi driver then handing over to a Jordanian host. 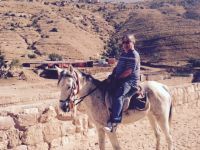 All very easy and the Jordanians make you very welcome. On the way back, if taking this route, do make sure you have 20 dinar local currency to pay the crossing tax. Petra is everything one would expect. 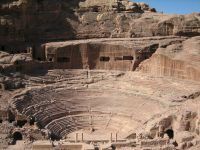 Established possibly as early as 312 BC as the capital city of the Nabataeans, it is a symbol of Jordan, as well as the country’s most-visited tourist attraction. Petra was for centuries the meeting point of the main routes used by camel caravans transporting spices between the Mediterranean and the Near East, Africa and India. The many earthquakes that hit Petra triggered a slow decline for the city. Conquerors came and went including Emperor Trajan in AD 106, the Arabs conquering in 636. The Crusaders constructed a fort in the 12th century and Petra returned to its ancient splendour, but soon they withdrew, leaving the city to the Bedouins and other local people until the early 19th century, when it was visited by the Swiss explorer Burckhardt. It has been subjected to earthquakes and the most opposite of weathers. A few days before Business Travel News visited the site, with the temperature in the eighties, it had been snowing! Once past The Treasury the descent continues through what is known as the Street of Facades, via The Theatre, Roman. You are in a gorge with the ancient drainage still to be seen along the walls of the ravine. The engineers of Rome were kings of the aqueduct. Finally you emerge into the bright sunlight of the city centre, all around monuments to a glorious past including the remains of The Nymphaeum (a water spring), Colonnaded Street, Byzantine Church, Winged Lion Temple and the Arched Gate. The actual central area is sparse and it is difficult to imagine what this must have been like in ancient times, a busy market place perhaps, or just a central meeting location. Although there are excavations continuing on the flat, rounded hills to either side, the overall impression is of rocky desolation; in Petra’s prime the landscape in all directions was covered with buildings – houses big and small, temples, market-places – all of them long since collapsed. Some archaeologists theorize that most of Petra is in fact still hidden beneath the dusty soil, and that all the facades and the buildings that have so far been exposed are the tip of the iceberg. Petra is exactly as you imagine it but DO prepare to spend some considerable time there. If you are coming from an Aqaba off a cruise ship be very certain what you are actually be offered by the cruise tour. We ended up with a highly unsatisfactory 3 hours. Some of out party in hurrying were reduced to exhaustion. Some others paid $50 EACH for a buggy back to the entrance. This accurate as of April 2014.